A former police officer has been given a suspended prison sentence after he tried to claim £3,500 handed in to police belonged to him. Lewes Crown Court heard Peter Yeats, 32, made several telephone calls to the force in the false name of Kirk Rose claiming his wife had dropped the cash. He resigned as a Neighbourhood Response Sergeant at Hastings on 16 September after his arrest on suspicion of fraud. He was sentenced on Monday to three months in jail, suspended for a year. Yeats was also ordered to carry out 60 hours of community service. The court heard Yeats spotted an entry on an incident log in July that a cash-filled bag had been handed in by a member of the public who found it next to a footpath near Plumpton Racecourse. He claimed his wife dropped it the day before, but colleagues became suspicious because the poor state of the money suggested it had been in the open longer than that. They called a landline number for a Kirk Rose, but when he answered he said he had no knowledge of the money. The calls were eventually traced back to Yeats's police-issue mobile phone. Sentencing him, Recorder Christine Laing QC said: "To say this was a complete moment of madness is fairly underestimating the situation." Julian Dale, defending, told the court Yeats had been under significant financial pressure after he and his wife had their first child just over a year ago. They could not afford childcare so were juggling their full-time jobs with looking after their son. 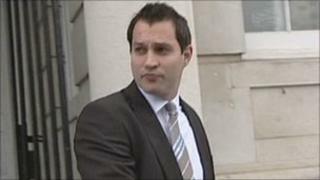 Yeats pleaded guilty to fraud by false representation at an earlier hearing at Brighton Magistrates' Court. Ch Insp Bruce Mathews, of Sussex Police, said: "Peter Yeats's actions went against the high standards expected of a Sussex Police officer."